Why Should We Spread the Word? Unfortunately, diabetes is a costly disease — in the case of life quality and economics. Spreading awareness helps educate those who know little about the disease, and it builds empathy toward those suffering from diabetes. New research released by the American Diabetes Association shows the total cost of diagnosed diabetes has risen to $327 billion — a 26% increase over a five-year period. Healthcare costs for those with diabetes is 2.3X higher than those without the disease. Additionally, $1 out of every $7 of health care dollars is spent on diabetes and its complications. 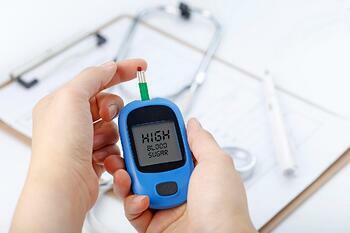 People with prediabetes are more likely to have a stroke, heart attack, and potentially develop type 2 diabetes. In the case of type 2 diabetes, it’s often preventable. Studies show that prediabetics who participate in structured lifestyle change programs lose 5-7% of their body weight through physical activity and healthier eating. They also cut their risk of developing type 2 diabetes by 58%! The color blue, and more specifically, an open blue circle, is the universal symbol for diabetes. Encourage staff to wear blue on Fridays in a show of unity for anyone suffering from diabetes. Better yet, pose a challenge to employees for every person who wears blue on Fridays in November, your company will donate a dollar to a diabetes organization. One of the best ways to raise awareness is to form a team to participate in a fundraising event. The American Diabetes Association hosts Step Out: Walk to Stop Diabetes events across the country. Start a company team to promote wellness and awareness while raising funds for a diabetes cure. Creating a group is a great team building exercise that also encourages employees to boost their leadership skills like problem-solving and goal-setting. Share a wealth of information for anyone who passes by a hallway bulletin board. Get as creative as you want — the more your board stands out, the more people will stop and read the content. The American Diabetes Association (ADA) has a great fact sheet with stats to post. Or create a collage with clippings from magazines like Diabetes Forecast or Diabetic Living. The U.S. Department of Health and Human Services recommends sharing the following information about diabetes with your employees via your monthly newsletter. To raise awareness about diabetes and healthy living, [your organization]is proudly participating in National Diabetes Awareness Month. Locally, [fill in statistics]live with or are at risk of diabetes. Another great resource is the type 2 diabetes risk test provided by the American Diabetes Association. Add the link to your newsletter for employees to test themselves. As an office, consider joining a lifestyle change program together. Make it fun and enticing so employees keep up with it. Host a monthly steps challenge, set up a gym buddy system, or take weekly spin classes at your local gym together. Type 2 diabetes — the most common form of diabetes — can often be controlled with healthy eating and being active. While some groups have a higher risk of developing type 2 diabetes than others, getting your team involved in healthy lifestyle choices together is never a bad idea, especially since about 1 in 3 American adults has prediabetes. If you’d like to build a CDC-recognized program, check out the curriculum of how to build a successful lifestyle change program. While diabetes may be common, spreading awareness can still help save a life. Perhaps an employee with a family history of diabetes has been putting off a physical because they’re scared. The resources you offer during National Diabetes Awareness Month might be the push they need to see their doc. Diabetes kills more people each year than AIDS and breast cancer combined and having the disease nearly doubles a person’s risk for heart attack. The risk factors are serious, and preventive measures are encouraged. By educating employees with proper resources and encouraging them to make small lifestyle changes, you show them you care and their health matters. For more information on getting the word out about diabetes, visit HealthFinder.gov or the American Diabetes Association. How has diabetes impacted your office? Share in the comments below.